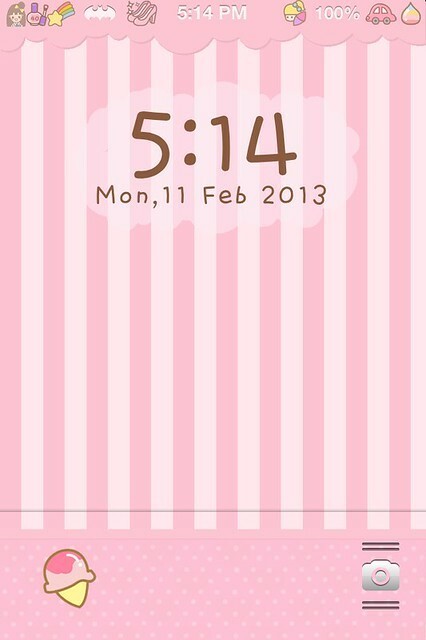 My Current Fav Pinkish iPhone Theme! Hello readers! How's your second day of CNY? I've seen many tweets about friends going back to hometown while some went to visit their relatives in KL (to get more angpau). I guess I've finished collecting my red packets from my family already because we aren't heading back to hometown this year (as mentioned in my previous blog entry). So my second day of CNY was quite uninteresting, I don't really find it special besides having the scrumptious meals served by mum and aunt. It feels even boring when we're not going to anywhere today so there's a lot of time for me to figure out something new with my iPhone. My brother actually helped me to jailbreak my iPhone a few days ago. He said it's superb easy to jailbreak an iPhone and it's not risky. HE SAID THIS ONE, NOT ME HAHAHA. Anyway I always wanted to get a pretty theme for my iPhone so I agreed with his thought. After he jailbreaks it, I actually didn't pay much attention on it because I simply dunno what should I do with it. Due to extreme boredom, I launched Cydia again to check if there's any nice themes for me to download and my eyes grew wide as I stumbled upon a theme named "Pinkie Cutie Theme". I took a look at the screenshots and this theme is just fantastic. It's all in baby pink and the icons are super cute and the layout comes with an unique design and and and.........."This is what I desire for after so long. Isn't it?" And guess what. This theme actually costs three dollars. (in usd) To be frank, there aren't many pretty themes in Cydia and most of them look terribly insipid. I repeat, I fancy pink a lot!!! (Repeated this for umpteen times!) 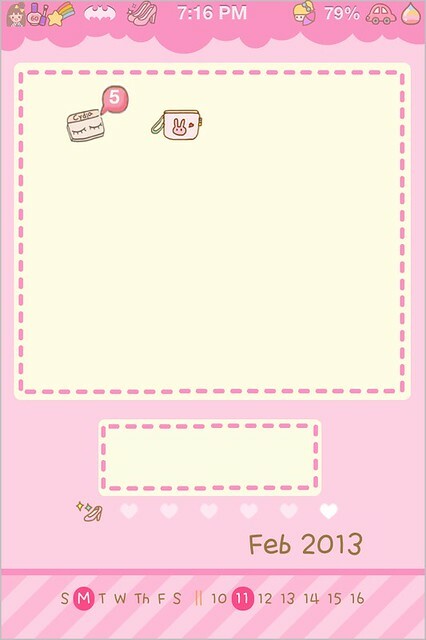 I really couldn't resist the temptation of cute and pink thingies lolol. This is why Teddy said I'm living in a Pinkyland which is made of pink fluffy cotton candies. HAHAHA OK. I guess nobody is interested with my imaginary Pinkyland so I'll continue my story about the theme. So yes, I freaking turn into a pink maniac and I bought that theme. -__- I know this is quite ridiculous but I......couldn't control. T_T Last time I even bought My Melody line stickers just because IT IS CUTE WTF. I was quite proud with myself because I successfully installed that theme into my phone, all by my own, after a few hours! (Because I usually hand all these work to my bro) After installing this theme, I realized that I still have to download something which is required to arrange the icons. (damn cannot believe that I bought this too I'm so damn stupid yessssss) The last thing I have to do is, install a freaking color keyboard to complete my theme. This time I'm not that impetuous to purchase it anymore, on the other hand, I actually approached my friend, Bianca who had installed many pretty themes for her iPhone too! Later, she was surprised that I bought the themes because there are CRACKED versions available for download and they are all FREE. *dafuq* I wanna burn myself that moment but once I look at my pinkish iPhone I think it's worth it LOL. I think I need a slap lololol. Thank you Bianca who taught me how to download the color keyboard for FREE! 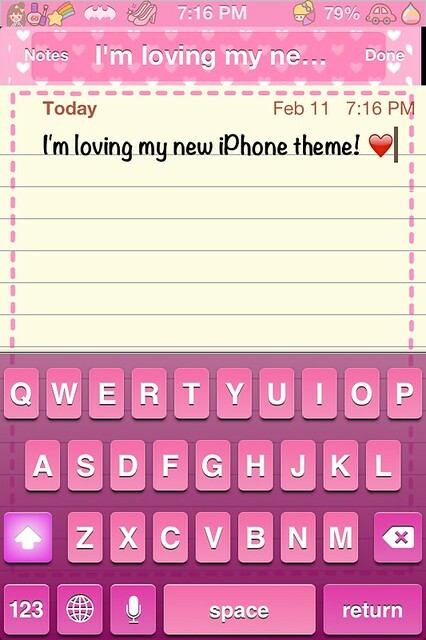 This will be my first and LAST time to purchase any freaking themes for iPhone! T__T Lesson learned. 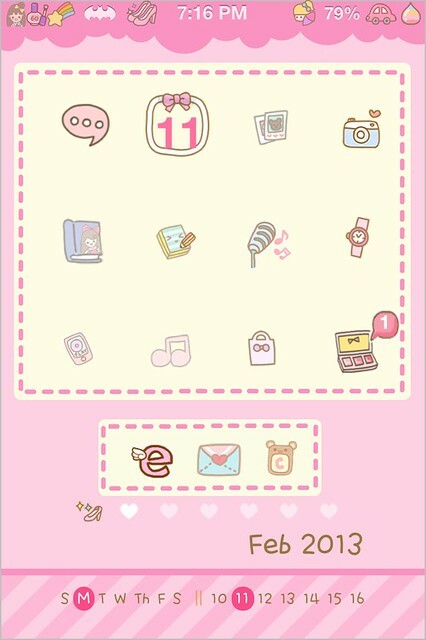 Ok ba, so take a look at my Pinkie Cute theme right now!!!! Pink stripes and polka dots!!!!!! My favorite! My pinkish purple keyboard!!!!! It makes me love typing even more hahahaha! So this is how my Cydia and Winterboard look like HAHAHAHA. EVERYTHING SINGLE THING IS IN P-I-N-K.